March is such a wonderful month. Winter is no longer as harsh, signs of spring start to appear, and it’s all about reading! March is Reading Month is so much fun, and a great way help kids find joy in reading. 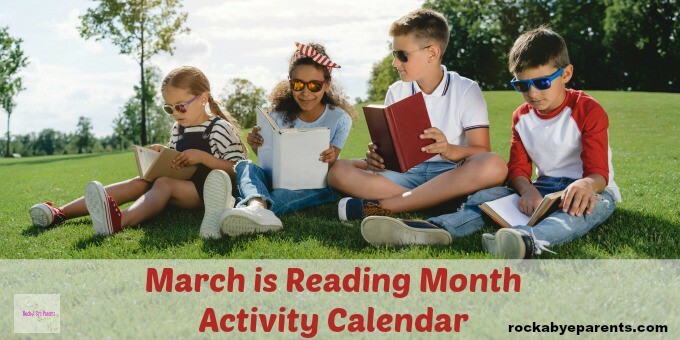 There are so many March is Reading Month activities to help add to the fun, and this March is Reading Month activity calendar will help you bring reading fun and excitement to each day of the month! As a child I always loved the month of March. Partly because it was the month that my birthday fell in, but also because I loved March is Reading Month. March is Reading Month was a really big deal in our school. There were so many fun activities that would happen during that month. One thing that every child looked forward to was being caught reading. Teachers would randomly call their students in the evenings and if the student was reading when the call came in then they could go to the office for a special prize the next day. Of course there was always a fun competition going on all moth to see which class could record the most reading minutes. The winning class won a pizza party, so of course everyone wanted to add to the total. The principal always sweetened the deal by vowing to do some crazy thing if the entire school passed a certain number of combined reading minutes. Still, what I always loved the best was the March is Reading Month activity calendar. Just before March started a calendar would be sent home that had fun reading activities for every day of the month. It’s amazing how many fun activities there are to help children get focused on, and to have fun with, reading. There are so many ways we interact with reading in our everyday lives, and these March is Reading Month activities help kids to see that. Even though it’s been many years since I participated in March is Reading Month activities at school (and we won’t say how many years) I still remember how much fun I had doing them. Now as a mother I see how much these activities get my son excited for reading too. Nick is at an age where he’s starting to be able to read books that interest him. He has always liked having me read to him, but he’s starting to pick up a book now and then to read on his own too. That doesn’t happen all that often yet, but with many of these fun activities he’s jumping for book time. One of the things I really love about so many of these activities is that they are things the whole family can get involved in. There are so many great ways to bond such as reading a recipe and then making it, or playing a board game that requires reading. 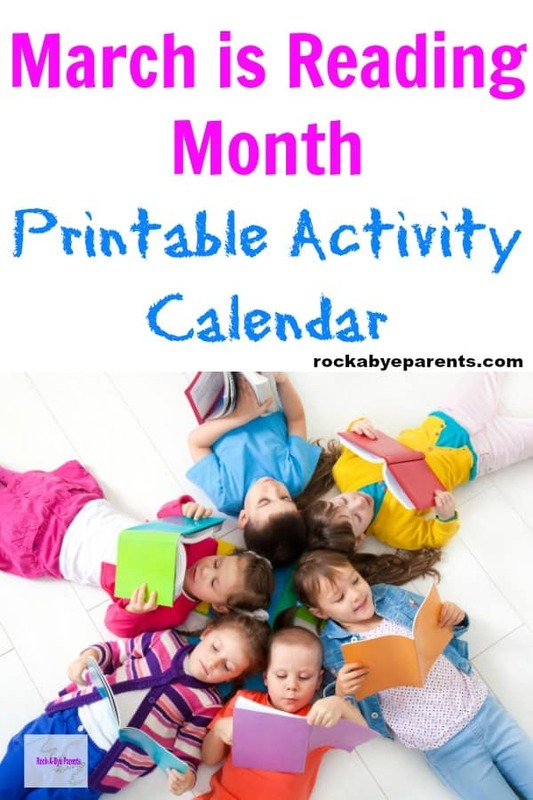 When I was a kid our March is Reading Month activity calendar had activities that we could complete every single day of the month. No day went without something fun to do. 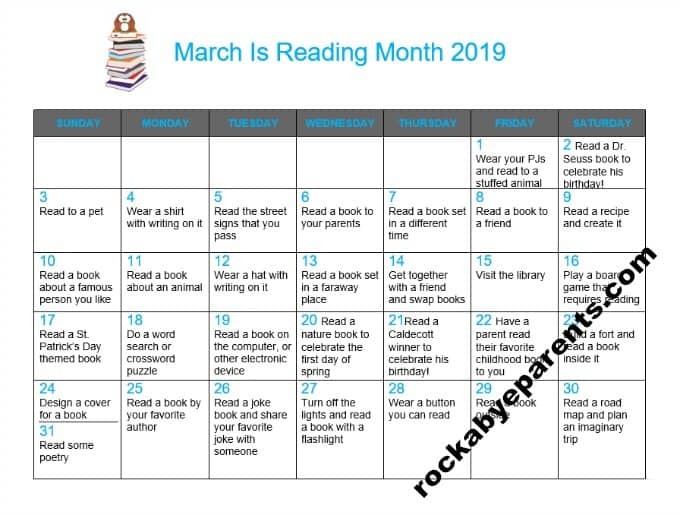 When I went to create this March is Reading Month printable activity calendar I followed the activity system my school used. Many of these activities were ones we did. I even called my mom up to ask her to help me remember some of the reading activities we had. As a child I simply loved March is Reading month. As an adult with a language arts degree I’m so proud of the program my school put together for the month of March. These fun activities help instill in children a love for reading that will last far past March is Reading Month. My son’s school does stuff, but not to the extent my school did and I think it is such a shame because I got way more out of the entire month then he does. 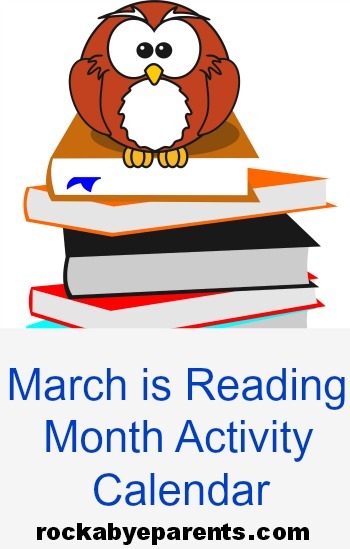 Whether you’re an educator yourself, or just a parent that wants to add some reading fun for March I hope this March is Reading Month activity calendar helps your children realize how much reading is. Great idea Elizabeth! I’m going to print it out and put it on our fridge! What a great idea, I like this – thank you for sharing! I did not know that about March. That’s a great calendar! Thanks for linking up with the Bloggers Brags Pinterest Party. I have pinned your post to the Bloggers Brags Pinterest Board! I love this calendar so much. I am going to try and implement it with The Girl. Also, the school you attended sounds awesome. I’d be interested in activities that schools ‘these days’ partake in for Reading Month. Thanks for linking up with Spread the Love! Thanks for sharing, what a great idea. Thanks for sharing at Sweet and Savoury Sundays, I’d love you to stop by this weekend and link up! Those are some great ideas. I vaguely remember doing some of those activities while I was in school. I was one of those, “non-readers,” so I don’t remember a lot. However, I do remember that these types of activities were actually fun for me. Now I’m an avid reader… of NON fiction. Growing up, everyone would always try to get me to read fiction. To this day I still rarely pick up anything fiction, but I am always reading (non fiction). Love this calendar! What fun. If you are interested, I hope to see you there Thursday! What a great idea to put together the calendar! I remember celebrating reading month while I was in school too. It’s so important to cultivate a love of reading in children that will continue into adult life.